The Harvard women’s soccer team seized its moment on a Saturday afternoon last November. A week earlier, the Crimson had suffered its first conference loss in two years, falling 2-0 to Dartmouth; Harvard now needed a win at home in its regular-season finale against Columbia to guarantee its second consecutive Ivy League title. Enter Margaret “Midge” Purce ’17. The lone player in league history to be named rookie and player of the year as a freshman, Harvard’s star forward had been uncharacteristically quiet in Hanover. But just under 30 minutes into a scoreless matchup with the Lions, that changed instantly. Emily Mosbacher ’16 sent a cross into the box (a pass into the rectangular area in front of the goal) and Purce, using the outside of her right foot, redirected the ball past the Columbia goalkeeper. 1-0 Crimson. In the second half, with the score now tied at one apiece, Purce struck again. This time, she headed a cross from Bethany Kanten ’15 into the side netting for the final margin in Harvard’s 2-1 win, ensuring that the Crimson would hoist the Ivy League trophy and return to the NCAA tournament. Purce’s humility aside (a trait women’s soccer head coach Ray Leone identifies as one of her many laudable attributes), her comment is also a window into how she has become an expert at scoring in a very low-scoring game. In fact, just halfway through her Harvard career, she already ranks tenth on the school’s all-time scoring list, with 21 goals. Purce calls “combinations” the foundation of goal scoring: a series of three to four quick passes with a teammate that facilitates beating a pair of defenders. This hinges in part on outthinking the opponent. (As Purce recalled, one of her former coaches on the U.S. women’s national team, April Heinrichs, suggested likening the process to a game of chess.) It also requires moving off the ball and talking to her teammates on the field. But above all, the success of the combinations depends on Purce and her teammates having an intimate, almost telepathic, understanding of one another’s tendencies—a byproduct of extensive, and some times harsh, on-field dialogue. Take her relationship with Dani Stollar ’18, a midfielder who followed Purce as the conference rookie of the year last fall. Earlier in the season, the two women sometimes failed to connect, leading Purce to demand that Stollar make clear what she was expecting Purce to do, and vice versa. In time, Stollar began making similar demands of Purce. Now all it takes is a tilt of the head or a slight hand gesture for the two to anticipate each other’s movements. “Somewhere around that thesis and antithesis, you find the synthesis,” says Purce of the dialectic that leads to team chemistry. Yet goal-scoring requires more than strong passing and teamwork. It takes a player who can quickly decide where to put the ball—and then actually direct it there, amid enormous excitement about the possibility of scoring. “There’s a split second,” Purce explains, “where you have to relax and focus on finishing” the play to actually score the goal. 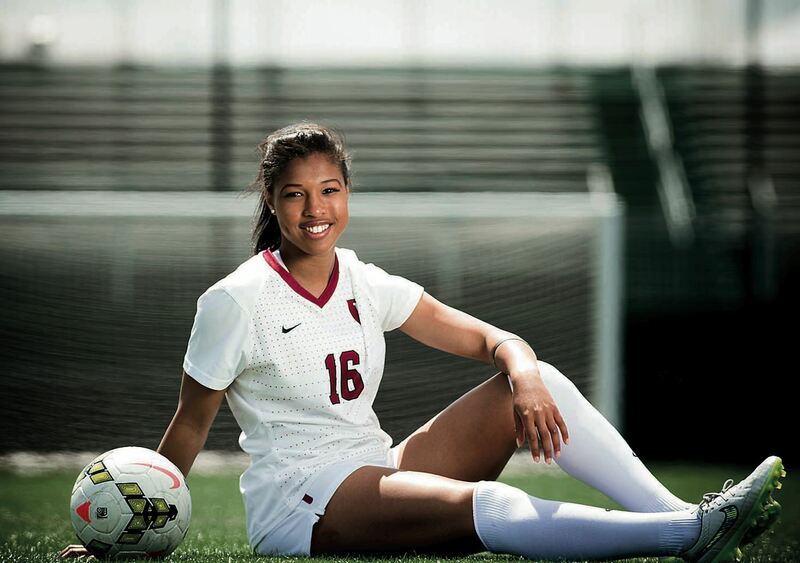 Currently on a pre-med track, she plans to eventually become a pediatric psychiatrist, but she hopes first to pursue a career as a professional soccer player and a member of the U.S. women’s national team. (She has been a mainstay in the team’s youth development program since high school.) From Leone’s perspective, both those goals are well within striking distance, but—fortunately for him and the Crimson faithful—Purce has two more years at Harvard during which to continue delivering scoring strikes on Soldiers Field.